ISLAMABAD, Pakistan - A suspected suicide bomber killed 13 people at a hotel near Islamabad's Red Mosque on Friday as the government reopened the religious complex for the first time since a bloody army raid ousted Islamic militants from the site. Hundreds of students clashed with security forces outside the mosque and occupied it for several hours before being dispersed. They denounced President Gen. Pervez Musharraf and demanded the return of a pro-Taliban cleric who was detained during the siege earlier this month. The bomb struck the Muzaffar Hotel, in a downtown market area about a quarter mile from the mosque. Local television showed victims -- many of them bleeding or badly burned, with their clothing in tatters -- being carried from the wreckage to waiting ambulances. Amir Mehmood, a witness, said he saw blood, body parts, and shreds of a Punjab police uniform inside the hotel. 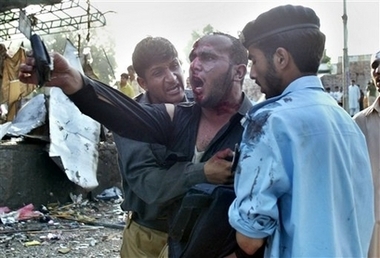 Khalid Pervez, Islamabad's top administrator, said 13 people were killed, including seven police, and 71 were wounded. Kamal Shah, another top Interior Ministry official, said initial reports suggested it was a suicide attack targeting police. Authorities recovered human remains that led them to suspect the bombing had been carried out by a suicide attacker, a senior police officer said on condition of anonymity because he was not authorized to speak to the media. Interior Ministry spokesman Javed Iqbal Cheema said investigators had also recovered a head believed to be that of the attacker. Cheema said the government had received intelligence information about a possible suicide bombing in Aabpara, the market area where the hotel is located. "There will be an inquiry for the security lapse," he said. There was no claim of responsibility, but Islamic militants will be suspected in what is the latest in a series of attacks in Pakistan since the July 10 army raid at the mosque left at least 102 people dead. Neighboring shops and food stalls also were hit by the blast. "I heard the blast and I came running. A policeman got blown into the air and landed away from the blast site," said another witness, Imtiaz Ahmed. The bombing came soon after police fired tear gas to disperse hundreds of protesters who called for hard-line cleric Abdul Aziz lead the prayers at the mosque. The demonstrators threw stones at an armored personnel carrier and dozens of police in riot gear on a road outside the mosque. After the demonstrators disregarded calls to disperse peacefully, police fired tear gas, scattering the crowd. "Musharraf is a dog! He is worse than a dog! He should resign!" students shouted. Over mosque loudspeakers, protesters vowed to "take revenge for the blood of martyrs." The students had forced a government-appointed cleric assigned to lead prayers to retreat, and a cleric from a seminary associated with the mosque eventually led the prayers. Police later retook control of the mosque, said Zafar Iqbal, the city police chief. Some protesters resisted and about 50 people were arrested. Friday's reopening was meant to help cool anger over the siege, which triggered a flare-up in militant attacks on security forces across Pakistan. Public skepticism still runs high over the government's accounting of how many people died in the siege, with many still claiming a large number of children and religious students were among the dead. The government says the overwhelming majority were militants. The mosque's clerics had used thousands of its students in an aggressive campaign to impose Taliban-style Islamic law in the capital. The campaign, which include¡¡threatening suicide attacks to defend the fortified mosque, raised concern about the spread of Islamic extremism in Pakistan. Militants holed up in the mosque compound for a week before government troops launched their assault, leaving it pocked with bullet holes and damaged by explosions. Friday's crowd shouted support for the mosque's former deputy cleric, Abdul Rashid Ghazi, who led the siege until he was shot and killed by security forces after refusing to surrender. Ghazi was the public face of a vigilante, Islamic anti-vice campaign that had challenged the government's writ in the Pakistani capital. "Ghazi, your blood will lead to a revolution," the protesters chanted. Police stood by on the street outside the mosque, but did not enter the courtyard where the demonstration was taking place. Islamabad commissioner Khalid Pervez said police forces did not want to go inside the mosque in case it led to a clash with protesters, but maintained the situation was under control. He said the reaction of Aziz's supporters was understandable and predicted things would calm down. In a speech at the mosque's main entrance, Liaqat Baloch, deputy leader of a coalition of hard-line religious parties, the Mutahida Majlis-e-Amal, condemned Musharraf as a "killer" and declared there would be an Islamic revolution in Pakistan. "Maulana Abdul Aziz is still the prayer leader of the mosque. The blood of martyrs will bear fruit. This struggle will reach its destination of an Islamic revolution. Musharraf is a killer of the constitution. He's a killer of male and female students. The entire world will see him hang," Baloch said. Pakistan's Geo television showed scenes of pandemonium inside the mosque, with dozens of young men in traditional Islamic clothing and prayers caps shouting angrily and punching the air with their hands. Officials were pushed and shoved by men in the crowd. One man picked up shoes left outside the mosque door and hurled them at news crews recording the scene. Wahajat Aziz, a government worker who was among the protesters, said officials were too hasty in reopening the mosque. "They brought an imam that people had opposed in the past," he said. "This created tension in the environment. People's emotions have not cooled down yet." Security was tightened in Islamabad ahead of the mosque's reopening, with extra police taking up posts around the city and airport-style metal detectors put in place at the mosque entrance used to screen worshippers for weapons. In the southwestern city of Quetta, meanwhile, gunmen killed a border province's government spokesman, police said. Raziq Bugti, spokesman and special adviser to the chief minister of Baluchistan province, died after unknown assailants fired a barrage of shots into his vehicle as he drove past a Quetta school, said Javid Ahmed, a police officer. The attackers fled on a motorcycle, Ahmed said. The nationalist rebel group Baluch Liberation Army claimed responsibility for the attack, said Babrak Baluch, a purported spokesman for the organization. Prime Minister Shaukat Aziz condemned Bugti's killing, describing it as a "terrorist act." Baluchistan has experienced scores of attacks on military and government targets, most blamed on ethnic Baluch tribesmen and nationalist groups demanding more royalties and control over the province's resources, such as natural gas. Taliban militants have used the province to launch attacks across the border on Afghan and foreign troops. Earlier this week, government troops raided a Taliban hide-out outside Quetta, where Abdullah Mehsud, a Taliban veteran of the US prison at Guantanamo Bay, Cuba, blew himself up to avoid capture. Musharraf has angrily rejected claims by Afghan President Hamid Karzai that Mullah Omar hid in Quetta, insisting that the Taliban leader was in Afghanistan's neighboring Kandahar province.